Does a version 1.0.0 mean a major refactoring of KooZic in comparison to v0.8.0? Actually not at all. This instead refers to major internal changes making both versions incompatible, which justifies a version jump. However, that doesn’t prevent some improvements and new features to be included in this version. While versions 0.x were using Odoo v10 and Python 2, the branch 1.x uses Odoo v11 and Python 3. This is to make sure KooZic’s core is always up-to-date with latest technologies. Indeed, an Odoo version is supported 3 years, while the Python 2 support will stop on January 1st 2020. We are not there yet, but better keep a modern software! It can always be handy to easily share a track or an album. The v1.0.0 introduces the possibility to generate download links with one click. 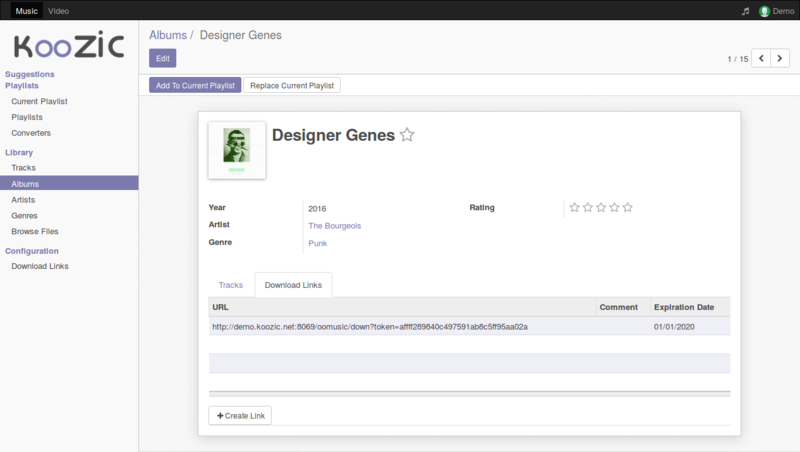 A link can be generated for a track, an album, an artist, a musical genre or even a playlist. It can be shared easily: when the link is first accessed, a ZIP archive is created with the corresponding files. It is possible to create several download links for an object, and it is also possible to define a lifetime for each link. KooZic uses the web browser’s abilities to read audio files, without the need of external plugins (and hopefully, Flash died a long time ago). This is pretty good. However, this means that we rely on the browser’s good will when it comes to stream the audio file… and this is not funny. In the naive approach used, the web browser completely handles the audio loading. With HTML5, the modern browsers use a ‘smart’ mode: they only retrieve what is really necessary to avoid wasting bandwidth. That seems to be a good approach… unless you are listening to some one-hour track (such as a mega-mix). Indeed, this means that the connexion must remain opened during the playback time. If the server or you Internet connection fails, the connexion will stop, and so the playback. 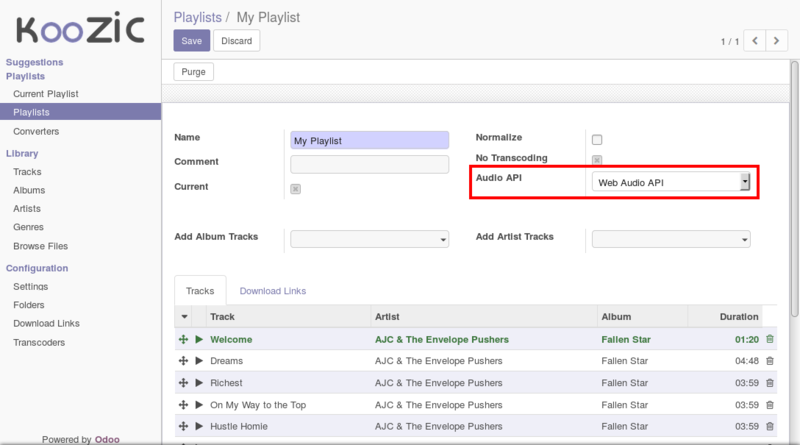 To circumvent this problem, a playlist can now use the Web Audio API. It gives the possibility to apply sound effects to a track, but in our case KooZic will use it to completely preload the track before loading. This implies a longer gap between tracks, but a much stable playback. This drastically reduces the workload in case of an installation with reduced resources (or a huge music library). The Subsonic API is available in XML (default) and JSON. I learned the hard way that there was no standard conversion between the two formats, meaning that the JSON API support from KooZic was pretty bad. Therefore, some softwares using this API instead of the XML API (e.g. Ultrasonic) were not using properly. That should now be fixed. If you installed KooZic without the installation script, you will have to uninstall manually. Do not hesitate to open an issue on Github in case of trouble!